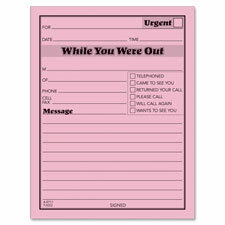 These pink pads for "While You Were Out" messages are top sellers. Gummed at the top so you can just rip off the top sheet and deliver to the recipient. 50 sheets per pad. 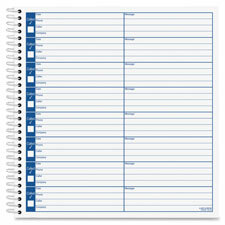 Spiral-bound voice mail log provides a permanent record of calls in one convenient location. Checkoff boxes next to each message identify which calls have been returned. 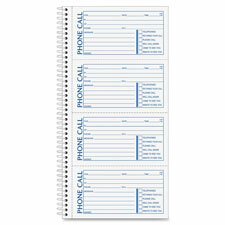 Preprinted message details include date, phone, caller, company and message. Each page includes eight messages. Repositionable adhesive on the back of these peel-off Write 'n Stick notes allows them to be stuck almost anywhere, from office doors to computer screens, without leaving any residue. Peel the top note off, leaving the carbonless record in the book. Simple prompts and ample space for details assure message accuracy on these tear-out, adhesive-backed notes. Each page of the message book includes four peel-off notes (2-3/4" x 4-3/4"). Two-part format includes originals in white and duplicates in canary. 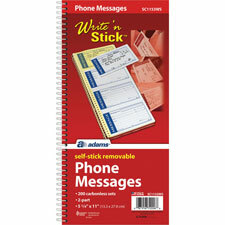 Phone message books allow you to keep a copy of all messages you take with a white original and a canary copy. User-friendly design offers preprinted prompters for message recipient's name, caller's information (name, company, phone and fax numbers), date, time with AM and PM, five lines for a message and message-takers signature. Six boxes describe the call so all you have to do is check one of the following: "Telephoned," "Returned Your Call," "Please Call," "Will Call Again," "Came to See You," and "Wants to See You." Message book has four message forms per page. 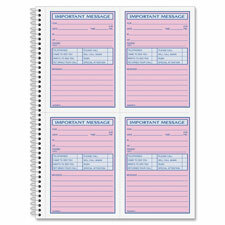 Spiral-bound Message Book offers two-part carbonless message slips (part one white with pink; part two canary). Contains 50 pages with four messages per page.